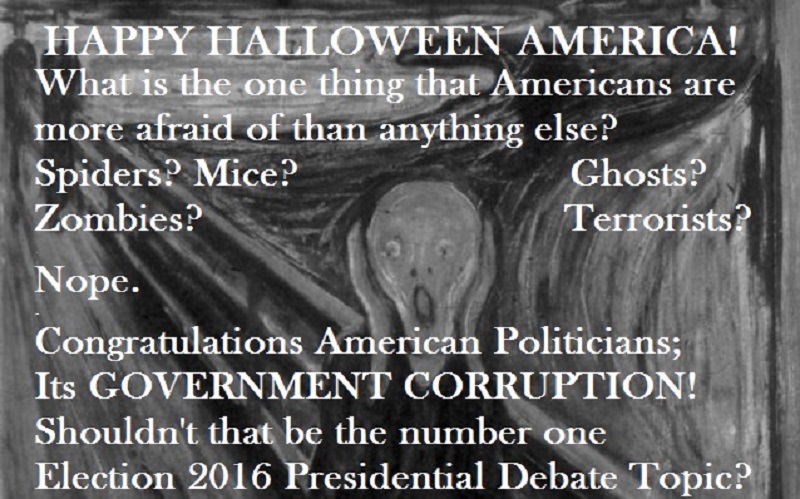 Halloween 2015: What are Americans most afraid of? Halloween returns bringing with it the annual tradition of frights and fears, costumes and pranks as well as Tricks and Treats. The question is, what are Americans most afraid of these years. One would think this Halloween would be like any other. The average American would guess the usual menu super natural frights such as ghosts, goblins, demons and Zombies. (Judging by Hollywood Movie and TV program offerings) Or, judging by the stereotype of women and city slickers, one might guess things like spiders, mice and bats. In most years and, on most Halloweens, those would seem to be safe bets. But alas, this Halloween you would be wrong with those guesses. This Chapman University Survey of American Fears (2015) recently announced the results from this years Halloween Season Polling. This year our American Government is the source of two of the top five fears of Americans, with Government Corruption striking fear in the hearts of nearly 60% of Americans. Now this writer is no politician or government expert, but should Government Corruption be the number one issues of the 2016 Election Presidential Debates? Yet, this writer has heard little to nothing about government corruption the political debate thus far, nor even in the 2016 Election Presidential Debates to date. How is this possible? Its seems Americans are to believe the Main Stream Media is unaware of Corruption in American Government. Even then, how is it possible for our elected officials, or at least the leadership of the Republican National Committee (RNC )and the Democratic National Committee (DNC) to not be aware of some degree of Government Corruption. How is it possible that Government Corruption has not been the mainstay of the Election 2016 Presidential Debates to date? Now, again this writer is no expert, but doesn’t 58% of Americans placing Government Corruption as their number one fear, illicit some level of concern from our elected officials? These folks who are supposed to represent us. Have their been some high level top secret Government meetings to address this concern? Have the Election 2016 Presidential Candidates gotten together and discussed this crisis in confidence the American People have in their Government and Politicians? Correct this writer if he is wrong, but in an election wouldn’t any candidate receiving 58% of the vote be considered as having won in a “landslide”. In fact, this writer has written many credible articles of his particular experiences and knowledge of government corruption. However, Main Stream Media refuses to print them. This writer is instead forced to post them on blogs and “Tweet” and “post” them in other Social Media. )Perhaps that is why this writer has 77000+ followers on Twitter.) The fact of the matter is that our Main Stream Media is complicit with corrupt government officials in censoring the news of government corruption. (This despite Main Stream Media Fourth Estate obligation is to keep government transparent and accountable.) Again, this writer is aware of government corruption from personal experience and investigative research. This writer also has first hand knowledge of the censorship by Main Stream Media of his well documented articles exposing government corruption. All that having been said, it is this writer’s advice to his fellow American Citizens that they contact their elected officials and let them know how they feel. The one and only one Progressive Tyrant Class pretending to be two major political parties views your silence as consent to anything they do. Go to their public appearances and confront them. My advise is to observe “proper decorum” for at least two months. If they haven’t satisfactorily addressed your concerns within two months, they have no intentions of doing so. (Hundreds of Minnesotans have asked every year since 2005 for a hearing dedicated to receiving evidence and testimony of systemic corruption in the Minnesota Judiciary. And every year we have been refused.) After 2 months, elected officials have “play book” handed down over the years from politician to politician on how to give you the run around. Finally, at 58% of Americans living in fear of Government Corruption, the problem has reached the level where it requires and demands presidential action. As has been said, government corruption should be the number one issue for all Election 2016 Presidential Debates. Demand your preferred political party make government corruption part of the rest of the Election 2016 Presidential Debates. If they don’t respond, take to Social Media and out them. Participate in the Twitter exchanges during the rest of the Election 2016 Presidential Debates. And for gosh sake, grill our Federal and State Legislators, Executives and Judiciary. Again, this 1 Progressive Tyrant Class pretending to be 2 major political parties views your silence as your consent. Remember and take heart in knowing you are not alone. At least 58% of your fellow citizens identify government corruption as their number one fear. This writer personally takes heart at knowing that at least 58% his fellow Americans share his view of our corrupt government. WE THE PEOPLE surround them. 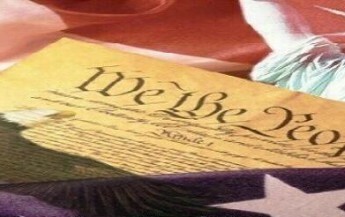 Together WE THE PEOPLE can force government transparency and accountability.